San Francisco activist, and Critical Mass co-founder Chris Carlson will be speaking about his new book "Nowtopia - How Pirate Radio Programmers and Outlaw Cyclists and Vacant Lot Gardeners are Creating Community"
HOW TO BUILD PLAYGROUNDS WHERE KIDS LOVE TO PLAY. Location: near the pizza oven. Rain location: in the rink house. 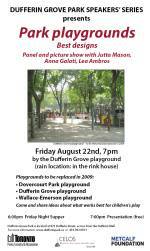 In the summer of 2000, the Toronto school boards tore out 172 playgrounds. Around the same time, provincially-funded daycares removed many of their best structures. And the City government began a $6 million “playground safety project” that resulted in the replacement of 49 park playgrounds and the removal of swings, climbers, and other play pieces in hundreds of other park playgrounds. Many parents objected, saying that the new plastic playgrounds and replacement pieces were dull and dumbed down. 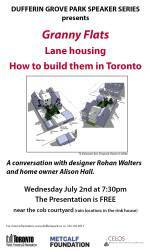 Granny Flats: How to build them in Toronto, with architect Rohan Walters, home owner Alison Hall and city planner Elise Hug. Location: near the cob courtyard. Rain location: in the rink house. In August (date still undetermined), the Speakers Series conversation #4 will be about how the “pattern language” of architect and master builder Christopher Alexander works for parks. More information: www.dufferinpark.ca. Park friend Andrew Munger is bringing San Francisco activist and Critical Mass co-founder Chris Carlson, to discuss his new book "Nowtopia - How Pirate Radio Programmers and Outlaw Cyclists and Vacant Lot Gardeners are Creating Community". Andrew says "Chris is a very engaging speaker and will be discussing issues of interest to our community." Copies of "Nowtopia" will be available for purchase. 7:30 PM near the bake oven, or in the Rink House in case of rain. For more information about "Nowtopia" follow the link below. 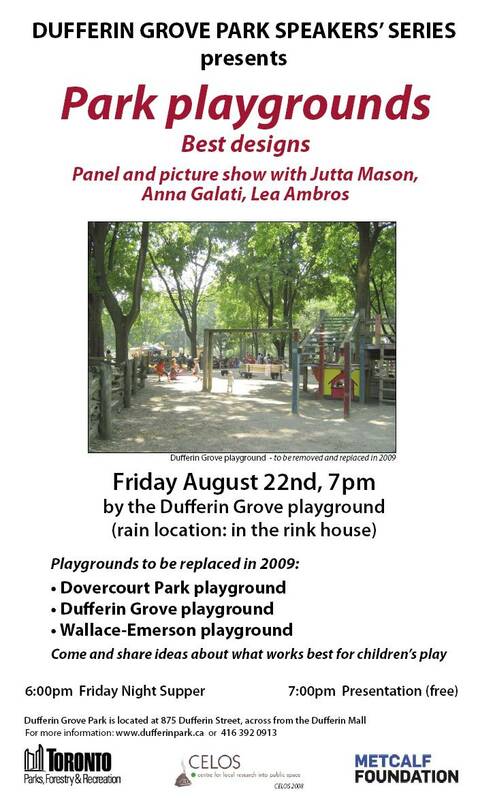 Dufferin Grove Speakers’ Series #2: NEIGHBOURHOOD HISTORY, May 23, 7.30 pm. By the pizza oven (in the rink house in bad weather). This session will show the research of CELOS worker Michael Monastyrskyj, who has been gathering local history pictures and articles on this area. The presentation focuses on the economic history of the Wallace railway triangle lands and Dundas and Bloor Streets, plus old maps and photos of the park, and of the surrounding neighbourhood. All presentations are limited to 20 minutes in length – the rest is conversation.